In an alternate Victorian world controlled by clock towers, a damaged clock can fracture time and a destroyed one can stop it completely. It's a truth that seventeen-year-old clock mechanic Danny Hart knows all too well; his father has been trapped in a Stopped town east of London for three years. Though Danny is a prodigy who can repair not only clockwork, but the very fabric of time, his fixation with staging a rescue is quickly becoming a concern to his superiors. And so they assign him to Enfield, a town where the tower seems to be forever plagued with problems. Danny's new apprentice both annoys and intrigues him, and though the boy is eager to work, he maintains a secretive distance. Danny soon discovers why: he is the tower's clock spirit, a mythical being that oversees Enfield's time. Though the boys are drawn together by their loneliness, Danny knows falling in love with a clock spirit is forbidden, and means risking everything he's fought to achieve. But when a series of bombings at nearby towers threaten to Stop more cities, Danny must race to prevent Enfield from becoming the next target or he'll not only lose his father, but the boy he loves, forever. Sky Pony Press, with our Good Books, Racehorse and Arcade imprints, is proud to publish a broad range of books for young readers picture books for small children, chapter books, books for middle grade readers, and novels for young adults. Our list includes bestsellers for children who love to play Minecraft; stories told with LEGO bricks; books that teach lessons about tolerance, patience, and the environment, and much more. While not every title we publish becomes a New York Times bestseller or a national bestseller, we are committed to books on subjects that are sometimes overlooked and to authors whose work might not otherwise find a home. Tara Sim can typically be found wandering the wilds of the Bay Area in California. When she's not chasing cats or lurking in bookstores, she writes books about magic, clocks, and explosives. 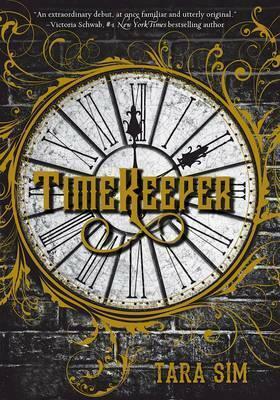 Timekeeper is her debut novel. Follow her on Twitter at @EachStarAWorld, and check out her website for fun Timekeeper extras.